As part of my kayak build I built an Aleut paddle from a partially finished blank at the Skin Boat School in Anacortes. I also wanted a spare or storm paddle, as the Eskimos used. If a solo kayaker lost their paddle at sea he would be in big trouble, as they could not swim in the ice cold water, and could not reach the paddle using just their hands. Typically, Eskimos did not know how to swim, as the water was too cold to learn. Also, during storms they used a double bladed short paddle in a manner like a canoe paddle, sliding their hands from one end of the paddle to the other. I did a test build, and if it doesn’t break it will be my spare or storm paddle. The photo below shows my 8’ Aleut paddle, my 6’ storm paddle, and a red cedar 2 x 4 from which I built the storm paddle. It was sold as a 4 x 4 fence post at Home Depot, which I cut in half to make two 2 x 4s. . I made it using an original method, as far as I know. 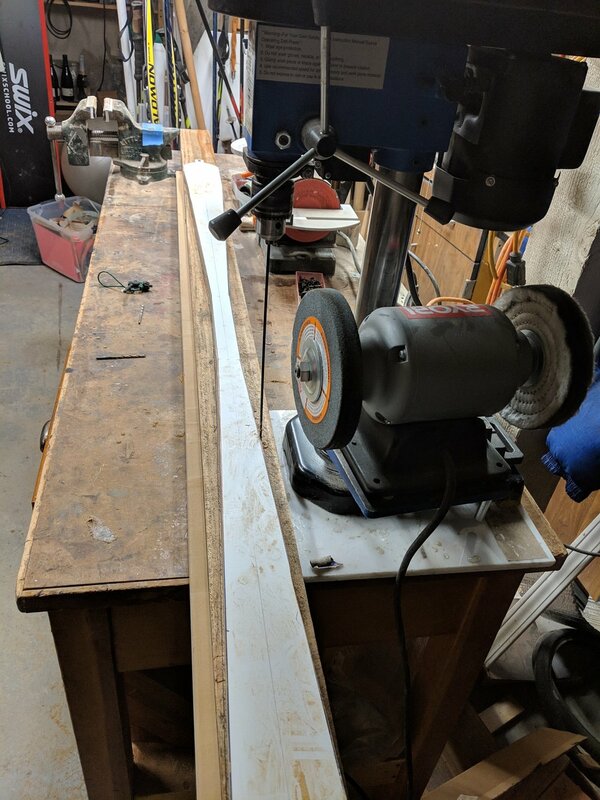 I made templates of the top view and side view of the paddle I wanted, attached those to the cedar, and drilled holes around the periphery of the shapes, using a drill press and a LONG bit, and drilling all the way through the 2 x 4. Then I used a power planer to remove wood down to the holes in both planes. Lastly I planed through the holes, and viola, a paddle was revealed. The loom (mid section) was thinner than I wanted, but I reinforced it with fiberglass and denim ( a knife making method). I’ll go out of my way to try to break it, but it might hold up. If I have to make another one, I have the templates I can modify to make the loom thicker.